March Snack Attack at Sidney Elementary! The March edition of Snack Attack featured Cowboy Caviar. To see a gallery from the day, as well as the recipe card, please click the read more link. As the transition from the winter to spring athletic seasons begins, there are many more student-athletes outside of buildings and utilizing the athletic fields. 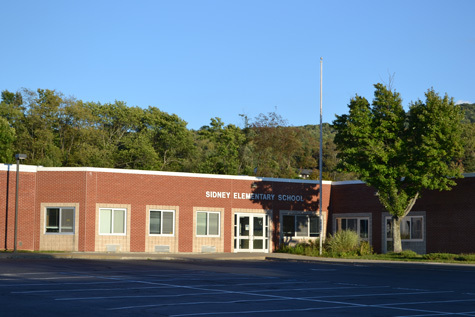 With this in mind, the Sidney Central School District is asking our community be receptive to requests with traffic flow around the Sidney CSD campus. With the after-school enrichment program dismissing at approximately 5:15 p.m. daily, there are many young students boarding buses between the elementary and junior/senior high buildings. The district will now keep the gates to the parking lot between the elementary and junior/senior high buildings down until 5:15 p.m. This survey seeks to evaluate student and community involvement in Farm to School activities, perceptions of the program, and their impact in Sidney Central School District. We hope to learn more about community interests, experiences, and priorities so we can direct our focus to the greatest Farm to School needs. Farm to School programs can incorporate a variety of activities but, as a whole, work to increase the use of local food in school meals; integrate food and agriculture education in the cafeteria, classroom, and community; and empower students through involvement in their local food system. Please follow the "read more" link for more information and for the link to the survey. Recently, the Sidney Central School District went past the 100th day of school. For first graders, the 101st day was a bigger celebration. Students in the grade spend the day dressed up like the 101 Dalmatians, and explored the number 101 through a variety of activities. The annual D.A.R.E. graduation was held Wednesday at the Sidney high school auditorium. This celebration is an annual tradition with Sidney Elementary fifth graders. The program, which has run for more than 30 years at the district, has been headed up by Sidney Police Chief Jan Gorshack for more than 20 years. The 13-week course is held through the first part of the year, with the graduation ceremony being the culminating event. During the ceremony, all kids are recognized and each class performs a skit showcasing the merits of D.A.R.E. Also, one student from each class comes on stage to read their essay about D.A.R.E. Despite being rescheduled because of bad weather, the annual Warrior Winter Wonderland event at Sidney Elementary drew more than 150 people this year. The event, originally scheduled for late January, was moved to late February. The Warrior Winter Wonderland is designed to provide students and families with a fun and interactive night at school. Attendees participated in a variety of stations, which were fun and educational, throughout the elementary building.